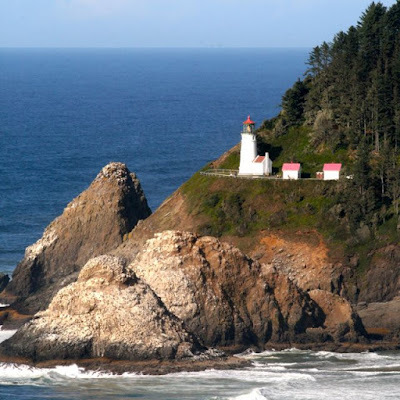 From where we were watching the Sea Lions, we also had a beautiful view of the Heceta Head Lighthouse. We wanted to hike up to the lighthouse and take a tour, but since it was over a 1/2 mile from the trail head and we had dinner reservations, we decided to move on. We will have to come back and visit this one with the children sometime! It's said the house at Heceta Head is haunted. The caretaker would often put his hat upside down on the table so blessings could be poured into it. When he came back to get his hat, it was upside down. That's the story I was told but I don't think I believe such stories.